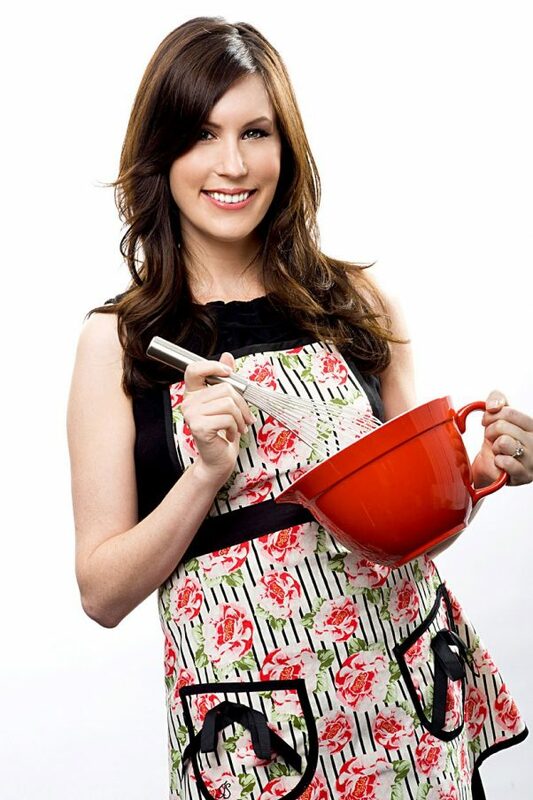 Tori Avey is the food blogger behind the popular blog, “The Shiksa in the Kitchen.” A culinary anthropologist and convert to Judaism, her blog explores the history of Jewish cuisine and other historical culinary topics. Tori authors “The History Kitchen” blog for PBS Food, and was previously featured in our Kitchen Careers interview series. Tori shares her recipe for cheese latkes below. Did you know that in addition to fried foods, dairy foods are also traditionally associated with Hanukkah? The custom of eating dairy foods for Hanukkah dates back to the Middle Ages, when the Book of Judith played an important role in the Hanukkah narrative. Judith was a celebrated Jewish heroine who saved her village from an invading Assyrian army. A beautiful widow, she plied the Assyrian army’s general Holofernes with wine and salty cheese. When the general passed out drunk, Judith beheaded him with his own sword. The Israelites launched a surprise attack on the leaderless Assyrian army and emerged victorious. In Judith’s honor, we eat dairy foods during Hanukkah. Though the Book of Judith is not considered a part of the official Jewish religious canon, the association between the Book of Judith and Hanukkah grew stronger during the Middle Ages. The Judith story predates the Maccabean Revolt; some scholars believe it is a reference to the real military events leading up to the Jewish holiday of Hanukkah. Whatever the case may be, this is one of my favorite Jewish stories, right up there with Queen Esther and the story of Purim. It’s got every element– a brave and beautiful heroine, an evil villain, wine, and cheese. What’s not to love? Speaking of cheese and all things dairy, today I’m going to share with you a cheese latkes recipe as well as some history of latkes. These mouthwatering latkes are made with ricotta cheese. 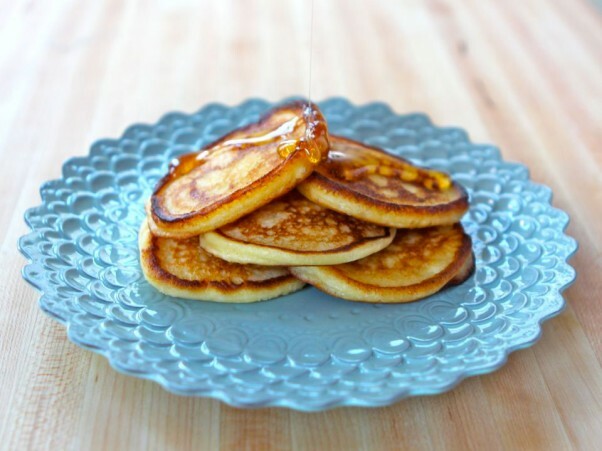 They have the same flavor as a cheese blintz filling in the form of a fluffy fried pancake. They’re fabulous, and every bit as appropriate for Hanukkah as potato latkes. Potato latkes are a more recent Ashkenazi invention that gained popularity in Eastern Europe during the mid 1800′s. A series of crop failures in Poland and the Ukraine led to mass planting of potatoes, which were easy and cheap to grow. But before potatoes came on the scene, the latke of choice was cheese. In honor of Judith and the history of Hanukkah, give these cheese latkes a try. They’re super easy to make and they’ll melt in your mouth. Imagine cheesy blintz filling made into a fluffy little pancake. So creamy and delicious! Use full fat, high quality ricotta for best flavor results… if you’re on a diet, lowfat will work, too. Top them with a little something sweet like honey or agave nectar. Knowing the history behind the latkes will make them taste even better! Thank you to food blogger Tori Avey of “The Shiksa in the Kitchen” for this guest post. Be sure to check out her recipe for cheese latkes below. Food blogger Tori Avey of "The Shiksa in the Kitchen" shares the history of latkes in a guest post on PBS Food. Fry the latkes for 2-3 minutes on each side until they turn golden brown. Test the first latke for doneness and make sure it’s cooked all the way through; if the latkes are browning faster than they’re cooking, reduce skillet heat. Expect some variation in the shape of the latkes, they won't form a perfect circle. Serve immediately.